A quick photo stop on Andy's daily commute (Frocester Hill) - not a bad view, foreground and background! Following our last update our 'virtual' friend and one of our earliest followers of this website, Mark on Cygnus III, wrote some erudite words - "if it's the right decision for you then it's the right decision." 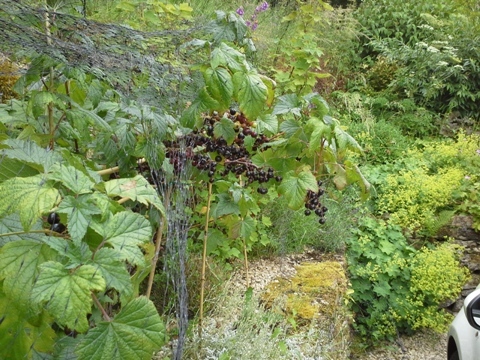 We continue with jobs around the cottage - at times the list seems endless, but it is getting shorter. 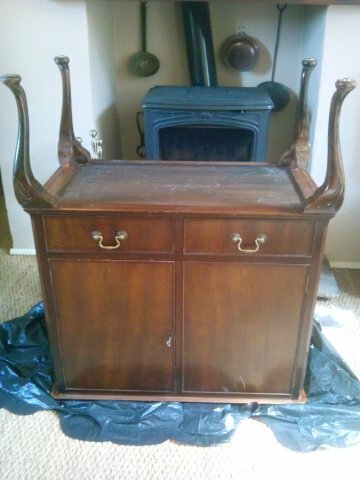 We have finally retrieved some of the items we had in storage, making the cottage feel even more like home rather than just a house. 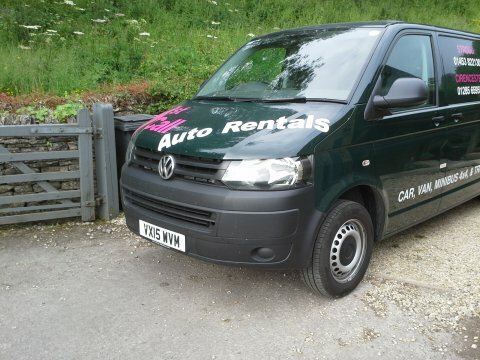 Six speed gearbox, air-conditioning and cruise control - what's not to like? We have recently been spending more time enjoying the pleasurable aspects of our new shoreside life, settling into the cottage and the village. It's been busy, occasionally stressful, but enormously enjoyable and reminds us that it's often very simple things that bring the biggest smiles to our faces - attending the village fête (I'm not sure if it was the duck racing or the classic cars that Andy liked seeing the most), hearing a folk concert in the village church, a few visits to our new 'local', a few countryside walks, pottering in the garden and enjoying some of the matches at Wimbledon on television. The temperatures in June were perhaps a little cooler than normal, but the day of the village fête was bright and sunny and the event was, as apparently always, extremely well supported. It felt so typically British, although an emergency was averted when, just as we approached, the ice cream stand ran out of ice cream! A rescue mission was launched to retrieve more so we were saved, although no more Flakes were available. 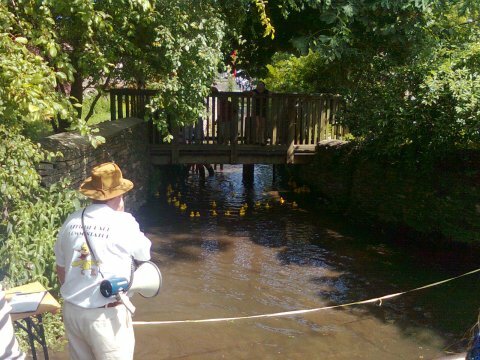 The duck racing was a highlight, despite our ducks, Francis Drake and Moby Duck (well, when we saw the choice of names, these had to be ours, didn't they? ), coming no closer than fourth at the finish line. I suspected fowl [sic] play.. 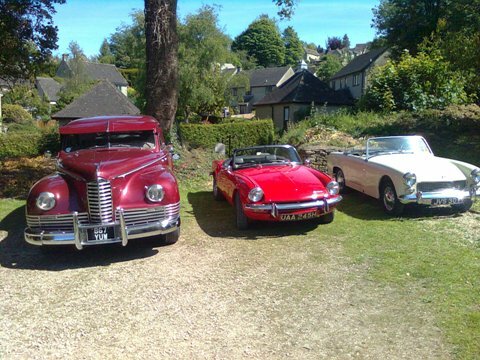 There was also a mini classic car show - ok, no minis, but a 1946 Packard, an Austin Healey and an MGB. 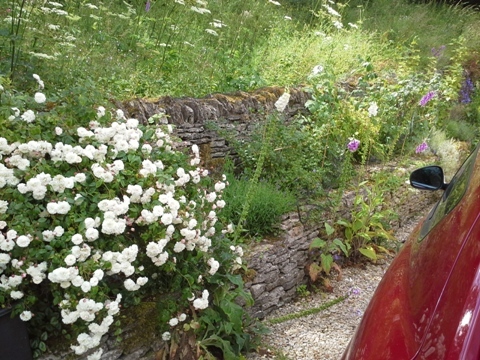 We stopped en route home at one of our neighbours who was participating the National Garden Scheme. 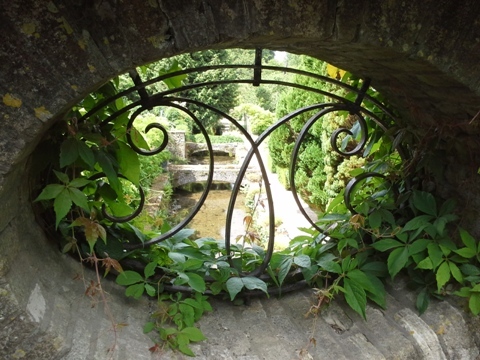 The garden is absolutely beautiful and it was great to meet our lovely neighbours and other locals over a cup of tea and what they assured us was (well we didn't have a Flake in our ice cream earlier) low calorie homemade cake. 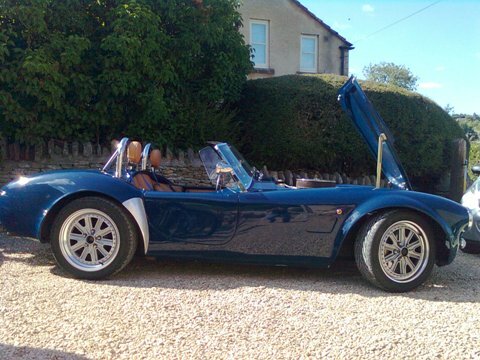 They also had a couple of classic bikes and an AC Cobra replica on the drive - they wouldn't give away the secret of what fertiliser you needed to grow those though. Do you start one of these from a cutting or seed? 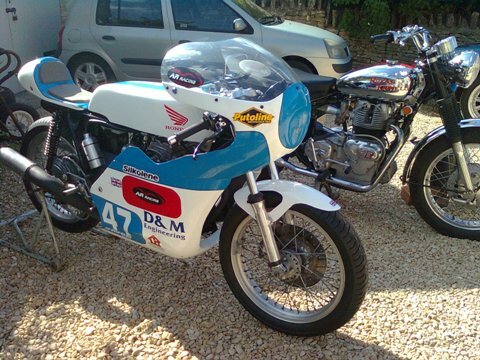 Do you think the two-wheeled varieties are easier to grow? The village produces an excellent magazine each month and I was very glad I'd taken the time to look through when I spotted an advert for an upcoming concert in the village church by Kathryn Roberts & Sean Lakeman. For those who don't know, this duo are big names in the folk scene so it was a must see for us and did not disappoint. It was a great evening with fantastic music in an unusual but intimate venue. We had another night of folky music in our local just a few evenings later - another duo not as famous, but very good even if, following the musicians finishing their last set, the locals began singing and the merriment wore on somewhat later than we'd envisaged. The superb meal we'd eaten there earlier somehow didn't quite absorb all the libations. Andy blamed the wine in which Matt had marinated his lamb. I, who drank nothing but juice after the wine we'd had with the meal, blamed the schnapps he was "forced" to sample. We have eaten in the pub three times now and we must say it deserves to continue to build a reputation as a top local foodie haunt. The menu intentionally isn't extensive, as everything is freshly cooked, but there is always ample choice and something to tempt every palate. They have a number of regular items on their menu plus a few weekly specials, all of which always look and taste delicious. 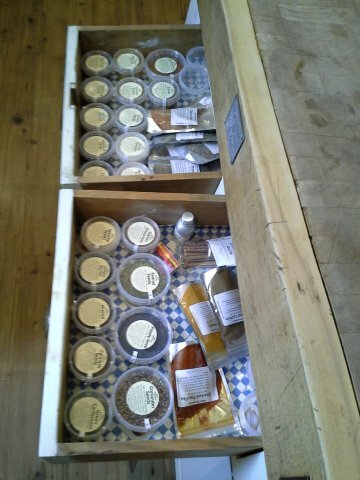 On the subject of food, we've stocked our spice cupboard (the drawers in the vintage butchers' block) courtesy of Spice Mountain who offer an excellent online shop for those who can't visit their shop in London's Borough Market. 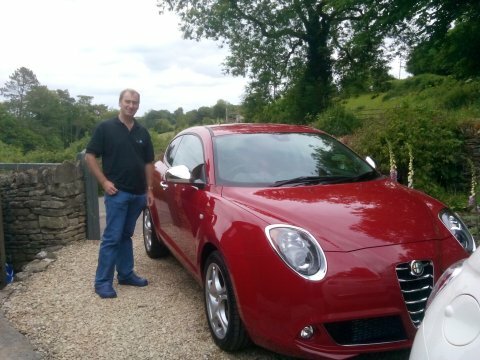 As you'll have seen from the headline photo, Andy was finally able to collect his car and the combo of the Alfa red and natural leather draws many admiring glances. 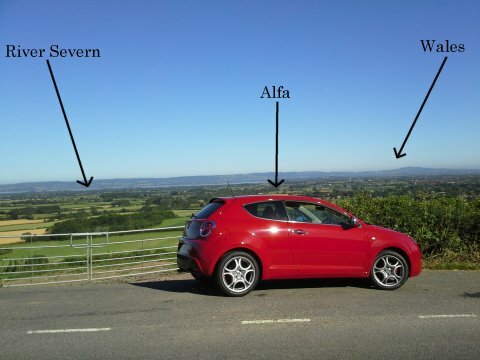 He even had his first wave from a fellow Alfa owner he passed en route to work one day. 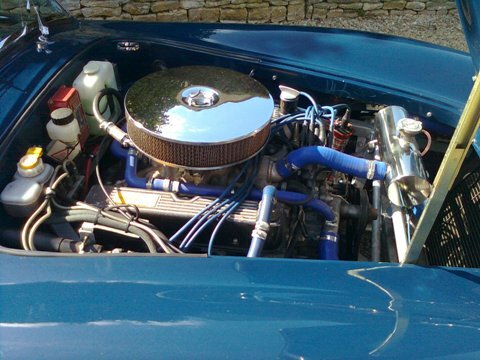 He remembers this happening often when he had his Alfa Sud many years ago at a time when Alfas were still quite an esoteric choice and consequently there weren't that many in the UK - not surprising really, when he grew up an Alfa GTV cost much the same as an E-Type Jaguar. Any colour you like, as long as it's Alfa red. 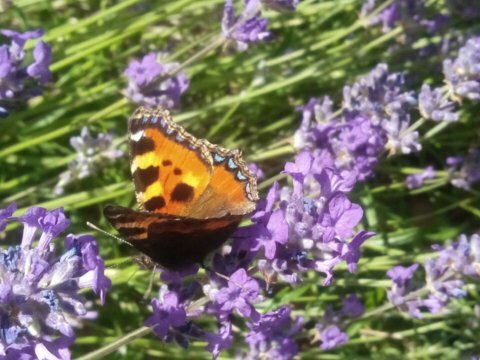 As we mentioned in our previous update, there were several plants & trees blossoming through the spring and we are discovering lots more coming into bloom as the summer progresses. 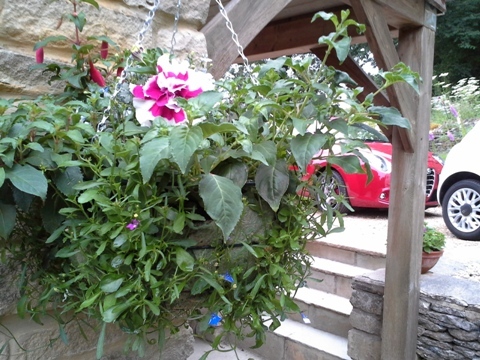 We were late planting the hanging baskets, but they are filling out nicely now, as are the pots of petunias by the front door. 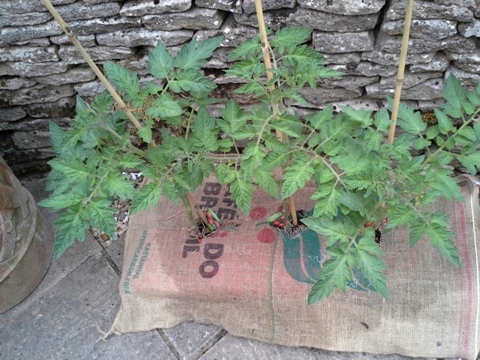 I had a typically lateral thinking moment and decided that a hessian sack would make the grow bags look a little, well, less like grow bags. 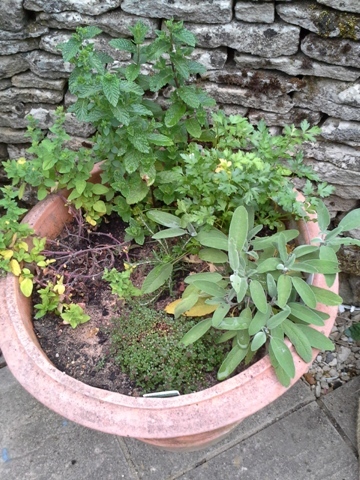 Parsley, sage, rosemary and thyme, ♫ plus mint and oregano, but I don't remember those in the song. A beautiful shrub rose alongside the drive. 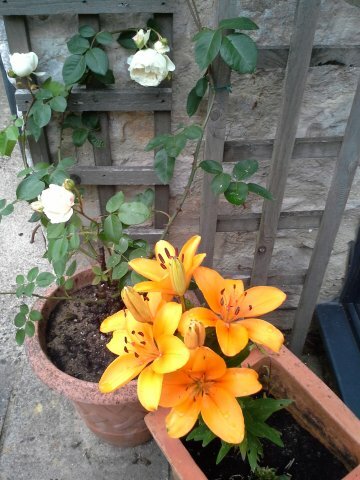 One of the roses and a lovely lily. A bonus was discovering a berry bonanza along the driveway wall. 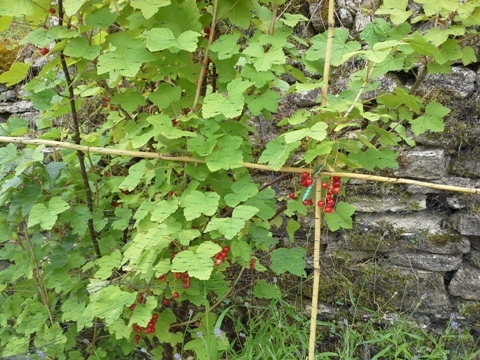 We've put canes up to support them and netted them over to stop the birds feasting on them before we do, although they have already sampled more than a few redcurrants. Today I found the first raspberry has ripened, and the other fruits are ready or nearly ready to harvest. 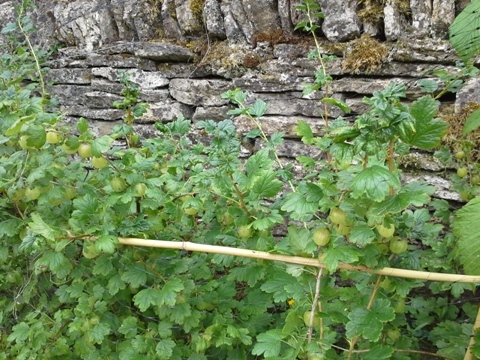 I hope I can make a gooseberry fool to live up to Andy's memories of the ones his mother used to make when he was growing up. 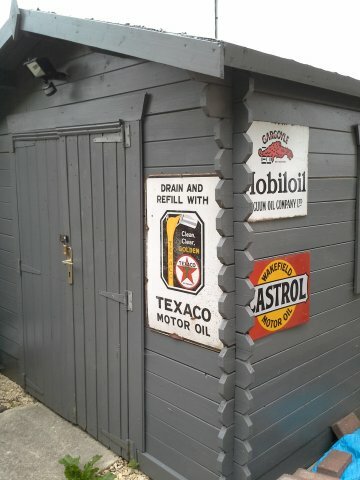 Another bonus in the garden - a proper shed. We discovered that the Parish Council website has details of a number of walks starting from the village that can be downloaded and we have already enjoyed doing a couple of them. 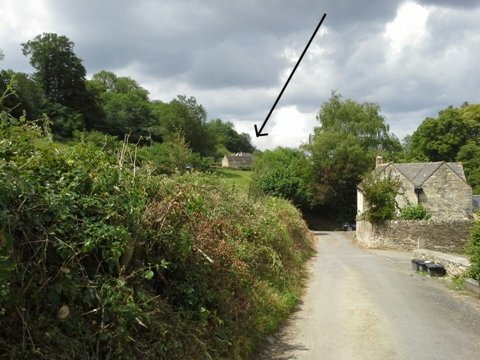 The return leg of the most recent gave us a nice view of our cottage, as well as a peek through a pretty 'peephole' of a historic manor in the village. The view across to our cottage. Through the looking glass, or in this case, the peephole. Just in time for Wimbledon, the temperatures rose and we've watched some great matches whilst sipping Pimm's in the garden. 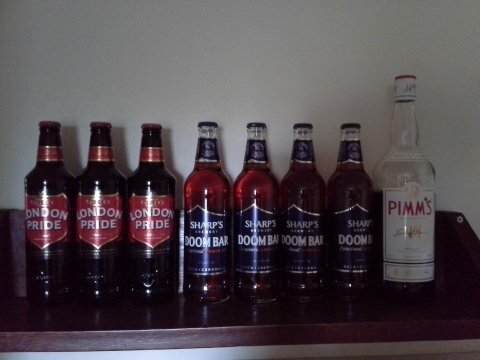 We've made sure we are well stocked with Pimm's and, despite recent press revelation that the bottled variety isn't brewed in Cornwall, the excellent Sharp's Doom Bar as well as some London Pride. Finally, neither of us would describe ourselves as political animals but we have, along with the rest of the world, watched the crisis in Greece unfold with genuine concern for the people of Greece as well as the rest of Europe. We do hope that the economic crisis can be resolved in a way that satisfies all parties and enables the Greek economy to recover and grow. We recognise that significant reforms may be necessary, but we also know many Greeks who, contrary to some opinion, are extremely hard working. We wish them well and hope the next few days brings a satisfactory outcome.